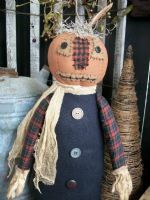 Pumpkin Head Jack is a great fall display piece for your home. 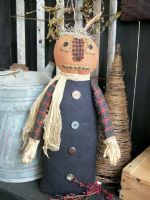 He measures 20" tall and would look great sitting among a fall display. He is made using black woolfelt with checked homespun arms that have been attached using rusty safety pins. Jack is wearing a pair of very grungy garden gloves! His head has been sculpted, painted and grunged for a prim look. The eyes, mouth and nose have all been hand stitched on. Jack has a weighted sand bottom so he can stand unsupported. He is defiantly a fall doll that you will want to display year after year! $45.00 FREE SHIPPING IN 48 U.S. Others email me for shipping costs. Pumpkin Head Jack is featured in the 2011 August/September issue of The Country Sampler Magazine.